Product prices and availability are accurate as of 2019-04-20 14:36:21 EDT and are subject to change. Any price and availability information displayed on http://www.amazon.com/ at the time of purchase will apply to the purchase of this product. 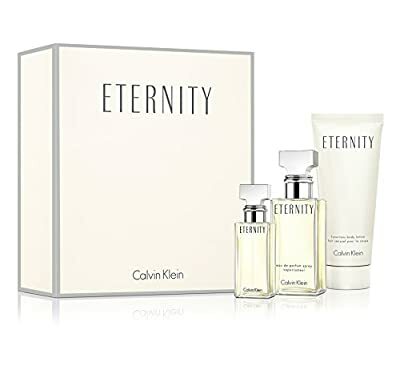 Celebrate the timeless romance of ETERNITY Calvin Klein. This gift set includes a 1.0 oz. eau de parfum spray, a 3.4 oz. body lotion, and a 0.5 oz. eau de parfum mini spray. Hers for $53.00, a $97.00 value. Celebrate the timeless romance of ETERNITY Calvin Klein. ETERNITY was inspired by the ideal of lasting love and intimacy. This classic scent is a harmonious blend of white flowers and creamy woods.